A few years ago, back when I worked a 9-5 job in the UK, I dreamed of living in China, speaking Chinese and learning all about Chinese culture and people. 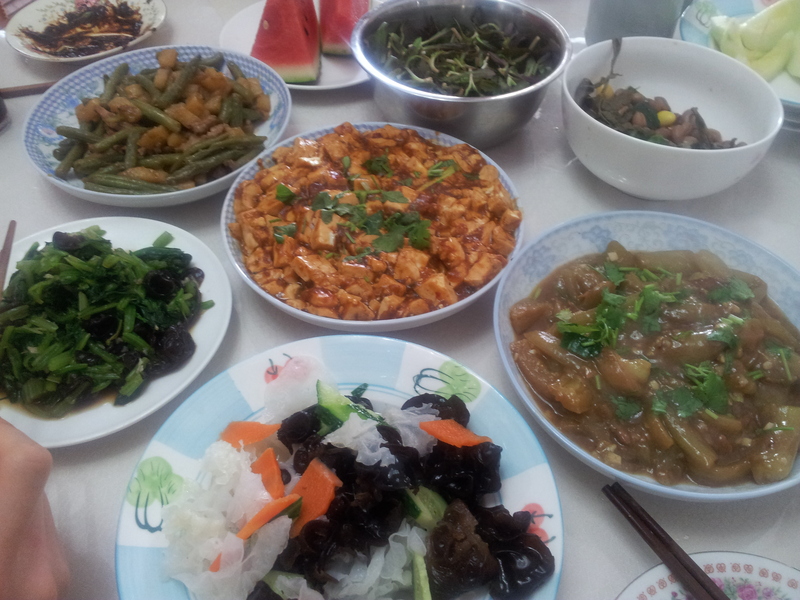 I could’ve never dreamed I’d be living in a Chinese family, speaking Chinese every day and being taught how to cook authentic Chinese food by a Chinese housewife who makes the amazing home-style North Eastern 东北 food. Not only that, but having my own Chinese kitchen in which to experiment. R, unfortunately, has not learned from his mum, so the kitchen is very much my domain, and it is a fusion of both West and East. I find I cook Chinese-style food the majority of the time, because some Western staples are expensive the buy here (like canned tomatoes) and I don’t have all the equipment, but there are also Western foods which we have very regularly, like homemade bread, porridge and cakes and bakes. They only have two gas rings, perhaps surprising given cooking with gas is their primary means of cooking. This is compared to 4 in most UK homes, though the size of the ring is bigger here in China. They don’t have an oven. That is unless you buy a free-standing one, as more and more people are doing to make Western dishes. They are often tiny. Many that I’ve seen are in a balcony area, perhaps to keep gas/cooking fumes away from the rest of the house. 1. 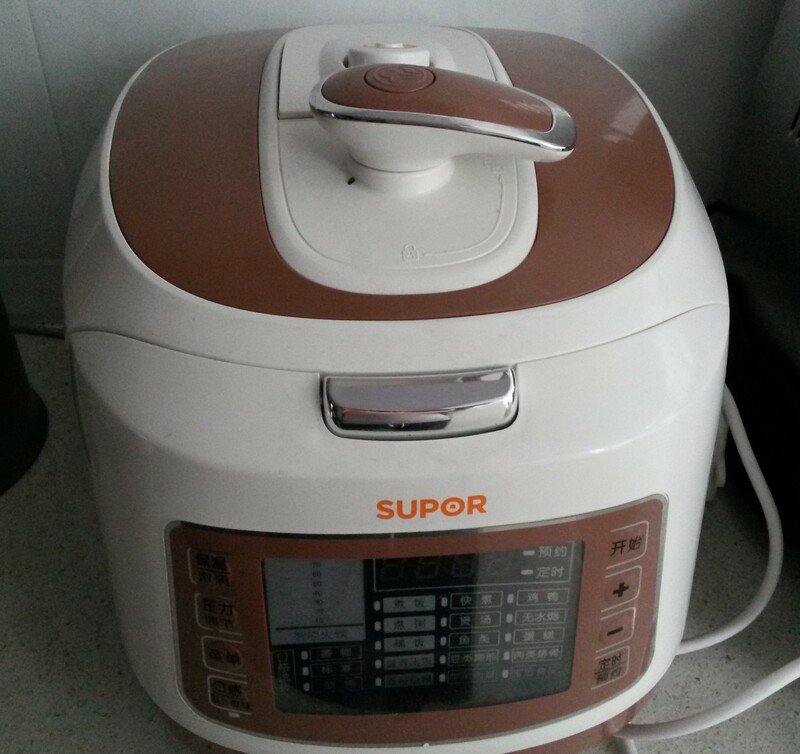 My rice cooker – this is the staple of a Chinese kitchen, and though presumably a pretty modern invention, it’s safe to say the very large majority of kitchens have one of these. The first time I came across a rice cooker was at university in the UK, where in my first year I had two Malaysian flatmates of Chinese origin. They both had rice cookers which they generally used in their rooms! Genius, as you can in fact cook a whole meal in your rice cooker. Add some dried meat to your rice, chuck vegetables in the mini steaming basket above, voila. Our current rice cooker in one with many settings, rice and congee, fish and ribs and all kinds of meat, even one for baking cake. Unfortunately I’m just not a fan of this one, as it uses pressure to cook, meaning in can’t be opened during cooking. It was bought just a few months ago by my parents-in-law, so we can’t replace it just now, but as soon as I can I will. 2. My soy milk maker – you can buy ready made soy milk here, but only imported (read: expensive). Chinese people just make their own to drink warm in the mornings. I need soy milk for tea and coffee, and for cooking, and this way saves LOADS of money compared to buying it ready made (a litre would cost 15-25 kuai, whereas I can make a litre for less than 0.5 kuai [although the machine cost almost 200 kuai]). Not only that, but you can use the machine to make other things too – fruit and vegetable smoothies, soups and baby food. It’s not only blends but heats too. If/when we return to the UK, I’ll definitely be taking this back with me. 3. My multi-tiered steamer – a simple instrument of cooking, not an appliance as such. But super useful. You can fit so much in one of these, not like the electrical steamers you find in the West. Ours pictured here has 4 tiers. We’ll often have two full of dumplings, plus one with sweet potatoes or corn on the cob or something, then the last one for steaming leafy greens. I’ve come to like steaming as a cooking method for things I wouldn’t have steamed before, sweet potatoes is one, homemade bread (softer for baby), fruits and also for defrosting. 3.5 My yoghurt maker – come to think of it, this may not be Chinese at all, but here in China is the first time I’ve ever owned one. At home I’d just go out and buy soya yoghurt (I’m vegan), but since they don’t have that here, I make my own! Super easy, super yummy and super healthy. Let’s call it a half. Do you cook Chinese food, wherever you are? What’s your best Chinese appliance? Or Chinese cooking tip? This entry was posted in Food and tagged Chinese in-laws, food, mother-in-law, vegan. Bookmark the permalink. Oh, I’d love to know more about your soy milk and yogurt makers! I generally don’t drink the ready made soy milk here in Beijing because it always has a lot of sugar in it. I make my own almond milk with my vitamix (definitely my favourite kitchen appliance & well worth the cost) but since I stopped eating dairy I really miss yogurt. Oh cool, i like almond milk too, but most of the almonds i see here aren’t raw/have added flavours. The only difference with a soy milk maker is it also boils the water to 80 degrees C, because otherwise the milk tastes very beany. And then it’s hot to drink, great in winter. You could still use your vitamix though, just boil the beans first (instructions online probably). I would love the link!! My bf got me bulk bags of almonds on taobao as well, I’m pretty sure they’re raw, or at least they have no flavour. I only really use the almond milk in coffee, but now I can start using it for almond yogurt as well! Oh, I should NOT have checked out your blog while hungry! That meal made by your MIL looks so good — especially the dish in the middle. Do you mind telling me what it is? Rice cooker and crockpot are essential in our kitchen for Andy, but I need the oven for the baking. I had no idea people made soy milk. Is it preferable due to taste or is there just not as much dairy milk? The dish in the middle is tofu, slightly spicy, but not sure of the name. It’s delish! I’ve never owned a crockpot, but i hope to someday! Most Chinese homes I visited had these days the induction cooking fields. Only my wife’s grandma still has the gas cooking but with incredible 8 gas rings! You’re totally right, an induction ring is a big player in many Chinese kitchens, acting as an extra gas ring (if there’s only two). It just so happens that we don’t have one, but MiL does. It’s also a necessity for people who like eating hotpot at home. I buy chocolate flavoured soy milk for breakfast because my boyfriend is lactose intolerant, but if you are vegan it doesn’t work, they contain a small quantity of powdered milk. It’s great that people there make their own soy milk! I thought that only happened in the countryside. I used to make kefir before but I stopped. I still have the little guys in the freezer, not sure if they will come back to life when I unfreeze them, haha. I think they only work with animals’ milk though.